Redie is fast-twitch 3D top-down shoot-'em-up that will challenge your speed, skill, accuracy and patience. Expect to die and then die again. The moment you think you’ve succeeded, another surprise bullet is waiting to take you out. Redie is not a game for the easily frustrated. Redie gives the player the ability to remap keys before the game launches, an option I always appreciate. Each level has a similar blocky theme, but different color schemes and layouts keep it from becoming repetitive. While the game’s colors are bold, they are appealing and well put-together. The music is also different for each level and seems composed to fit the theme of the level. Quiet music suggests a stealthier approach might be warranted. Heavy metal means it’s time for full-berserk mode. 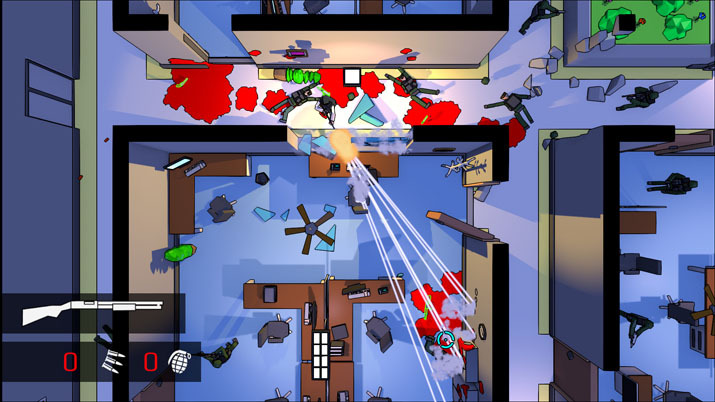 The action and style of play are similar other in-genre games like Alien Swarm and Hotline Miami. As the white-sleeved player character, you’re tasked with eliminating enemies as quickly as possible. Speed and precision are key as any mistake results in death. Re-spawning is easy, just press “R” on the keyboard. Since lives are infinite, I would tend to rank this game as “forgiving” regarding death. Nothing about Redie is forgiving. If the consequences of death were greater than they are, most players would rage-quit in the first 15 minutes. Easy death does add an element of realism in Redie. The main character does not have much health. He may survive a single bullet hit if it strikes a glancing blow, but most hits are head shots. It is closer to reality than your average hero quest where the main character can absorb bullets endlessly as long as they have a med kit available. There are contextual objects in the game that can assist the player. For example, the gym has balance balls and dumbbells. They provide little cover, however, and serve better as a means to block the enemy rather than A shield for bullets. I found the physics surrounding movable items amusing. At the slightest touch, objects will float over the floor like the puck on an air-hockey table. When my character launched a filing cabinet halfway across the room, he felt almost superhuman. Then he died again, seconds later. To add interest and difficulty to the base game, Redie has an additional layer of challenge in its Mastery system. This includes a series of goals to each level outside the primary survival objective. For example, to achieve mastery a player may need to kill two enemies with a rocket launcher and then finish the level within 20 seconds. The mastery system is not for the faint of heart. Even on the first and easiest level, achieving the goal is not simple. Players who enjoy playing games on “insane” mode may enjoy the additional work required to achieve mastery at all levels. Weaponry use is viscerally satisfying. The hearty chatter of the AK-47 and the monstrous boom from the rocket launcher adds an almost tactile pleasure to murdering hordes of anonymous enemies. 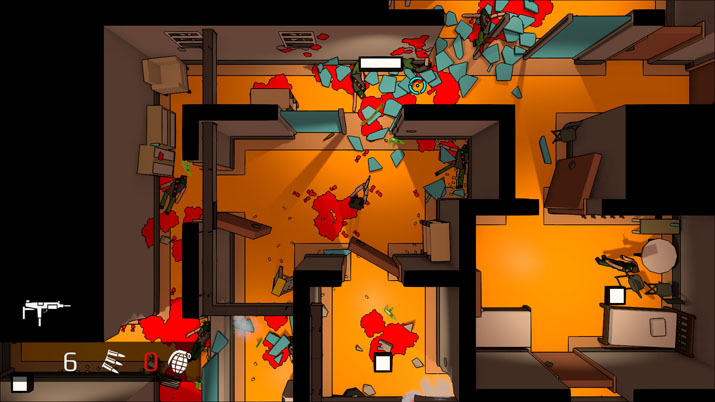 The rag-doll physics, gratuitous gore, and destructible walls help give the gunplay a kinetic feel. Redie's AI isn’t intelligent. It’s easy to get the drop on unsuspecting enemies. However, when nearby mobs are alerted to your presence, they will swarm. What the enemies lack in perception they make up for with precision sharpshooter skills. They can get in a distance headshot on you when they aren’t even on screen. They have blazing reaction times, so even if you approach an enemy without their knowledge, you only have about half a second to kill them before they kill you. I would like to see a limited snap-to-cover system, so it’s possible to have a fighting chance when taking on multiple enemies. A tiered difficulty system would also be a good idea. Redie has a lot going for it, but it’s twitchiness limits its audience to only the fastest of players. Keep the challenge, but leave a little room for slower players. I have never played a game that is as aptly named as Redie. One of the easiest achievements in the game to attain is the one awarded for 1000 deaths. Despite its difficulty and the frustrating element of constant death, Redie is an excellent game.